Software and Hardware support is vital to a business’s IT. It works to ensure smooth, trouble-free operations. In addition to software, device driver, and firmware updates, software and hardware can fail, requiring troubleshooting and repairs. iT1 Solutions offers a variety of software and hardware support services to keep your systems running at their best. Software support services are needed because software developers routinely update their applications by issuing security patches and software updates. Patches and updates are small programs that patch known software vulnerabilities, resolve recently discovered conflicts with other programs or devices, or add new features to the software. By keeping your software updated with the latest patches and updates, you can solve existing problems and avoid others. While keeping software updated sounds good in theory, it often fails in practice. Each one of your computers can have dozens of applications installed on it. Keeping an entire computer network updated on your own becomes a huge task that is often neglected. iT1 Solutions can take over your software support, conducting a complete inventory of your software and setting up automatic updates. Our software support services ensure that your software is well-maintained and patched. Our software support extends to troubleshooting software conflicts, file corruption, and errors. 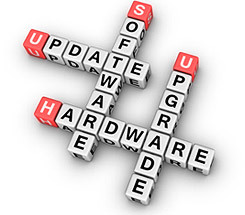 Not only must your software and applications be updated, but your hardware such as memory chips, hard disks and motherboards must also receive consistent updates and hardware support. Like software updates, hardware updates are used to patch known vulnerabilities, resolve conflicts with other devices, and add new features. Keeping your hardware and devices patched with the latest updates can solve and prevent problems and add new features. Updating hardware and devices is trickier than updating software. Most updates are specific to the device as well as the operating system. Choosing the incorrect updated could be disastrous. Managing your hardware support yourself can be intimidating, difficult, and dangerous if you do not understand what you are doing. In addition to basic maintenance, our hardware support services address hardware failures. Whether you have a failing hard disk array, a server that keeps crashing due to memory issues, or devices that no longer work, our hardware support team is ready to help. Many issues can be resolved remotely while others may require onsite support. Either way, timely repairs are one of our top priorities. iT1 Solutions is committed to providing prompt, reliable computer software and hardware support. We understand how important your systems are to your business and take a proactive approach to prevent problems. Should a problem occur, we work quickly to resolve it. Contact us today to find out more about our software and hardware support services.